NASA’s Mars rover Curiosity took this self-portrait on May 11, 2016 at the "Okoruso" drilling site in the foothills of Mount Sharp. NASA's Mars rover Curiosity is back in action after being sidelined by a glitch for a week. Curiosity put itself into a protective "safe mode" on July 2 after noticing an anomaly. 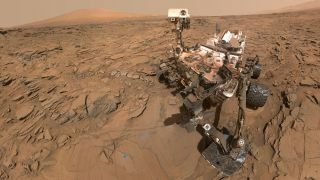 But the rover's handlers brought the six-wheeled robot out of safe mode on Saturday (July 9), and Curiosity is resuming full operations today (July 11), NASA officials said. The Curiosity team is still investigating the events of July 2, but they think they know what happened. "The most likely cause of entry into safe mode has been determined to be a software mismatch in one mode of how image data are transferred on board," NASA officials wrote in an update today. "Science activity planning for the rover is avoiding use of that mode, which involves writing images from some cameras’ memories into files on the rover’s main computer. Alternate means are available for handling and transmitting all image data." The car-size Curiosity rover has now entered safe mode four times since touching down inside Mars' 96-mile-wide (154 kilometers) Gale Crater in August 2012, recovering fully every time. The other three safe-mode events all occurred in 2013. The main goal of Curiosity's $2.5 billion mission is to determine whether or not Gale Crater has ever been capable of supporting microbial life. Curiosity's observations have allowed team members to conclude that Gale Crater once hosted a long-lasting system of lakes and streams, suggesting that the area was indeed habitable billions of years ago. Since September 2014, Curiosity has been exploring the foothills of the 3-mile-high (5 km) Mount Sharp, which rises from Gale's center. The rover is studying the different rock layers in the area as it climbs, searching for clues about when and why the Red Planet shifted from a warm and relatively wet world in the ancient past to the cold, dry place it is today. The rover should keep mountaineering for a while, provided it stays healthy; NASA recently extended Curiosity's mission through October 2018.